Deutscher Kunstverlag is reaching 100 years of existence. Being an art book and science publisher, its program encompasses all areas of arts, architecture, photography, monument preservation, archeology, and design. 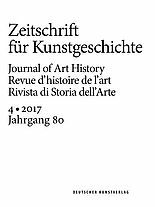 These topics form a considerable portfolio for all cultural interest, including exhibition catalogs, dissertations, art guides, monographs, art series, museum guides, standard works as the so-called “Dehio” or the “Karl Friedrich Schinkel Lebenswerk”, and renowned journals. By claiming outstanding content and design quality, we develop innovative publications in dialogue with scientists, museums, and foundations. Our backlist comprises about 800 available titles in German and English and is annually increasing by approx. 70 new releases. With our publishing house, De Gruyter is profiling its existing program, investing in the continuous digitization of content, and expanding its relations with international institutions. Please order review copies by sending an e-mail to reviews [ at ] degruyter.com.